Bestselling Australian author Deborah Abela grew up listening to the story of how her father was born in a Valletta shelter during one of the heaviest bombing attacks on Malta in the Second World War. After the war, her seven-year-old father and his family left an impoverished Malta and made the long journey to Australia. However, their new home wasn’t immediately the heaven they thought it would be. At the time Australia needed a bigger population to build the nation: with only seven million people, the country had to populate or perish, and so the continent championed migration. But this was also the time of the White Australia Policy, which meant Australia wasn’t always welcoming of the darker, Mediterranean-skinned new arrivals – and Deborah’s Maltese family suffered a lot. 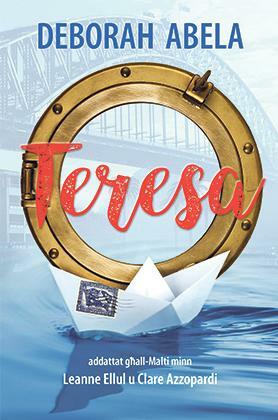 Inspired by her own family’s survival, Abela wrote Teresa, the fictional story of a young girl and her parents who, after the war set sail to Australia, leaving some of Teresa’s dearest behind in Malta. “It is a novel of courage, bravery and one very determined little girl,” said Abela. “Because, even though Australia had a lot to offer, everything felt strange and new. I based it on the story of my family, but I did a lot of research to determine what life was like for the new settlers in Australia,” she said. Teresa desperately missed her family and friends in Malta, especially when she started being bullied for simply being different: for not having her school lunch with Vegemite, for not speaking in the same accent, for being better at Maths than her school mates. But Teresa was a fighter. Just as she had survived the war, she was determined to make Australia her new home. First published earlier this year in Australia by Scholastic, the book was an immediate nationwide success, appeal-ing both to the vast Maltese communities there and to other Australians intrigued by what Malta had to endure during the war. Merlin Publishers has now published the book in Maltese, translated by award-winning children’s authors Leanne Ellul and Clare Azzopardi. It is aimed at children 9 years and over. Abela was in Malta touring schools, where she spoke about her family’s experiences and her writing, and generally mesmerised her young audiences with the verve of a seasoned storyteller. Teresa was launched at the President’s Palace in San Anton last week, upon invitation of President Marie Louise Coleiro Preca, who had first met the author and extended the invitation during her state visit to Australia. Abela is not only a bestselling children’s author in Australia, but she is also an ambassador for Room to Read: an innovative, global non-profit that seeks to transform the lives of millions of children in ten developing countries namely Bangla-desh, Cambodia, India, Laos, Nepal, South Africa, Sri Lanka, Tanzania, Vietnam and Zambia. “Every child has the right to an education and to the joy of reading. By helping to educate the world’s poorest, we are not only creating better communities, we are helping build a better, brighter world,” said Abela. Teresa is available for sale from all bookshops or online.